After six years of protecting them, former Attorney General Eric Holder triumphantly returned to his roots, the law firm where he defended Wall Street and the banking industry before his appointment as AG. As though this was ever in doubt. Eric Holder has gone back to work for his old firm, the white-collar defense heavyweight Covington & Burling. The former attorney general decided against going for a judgeship, saying he’s not ready for the ivory tower yet. “I want to be a player,” told the National Law Journal, one would have to say ominously. The terse, and at times combative, testimony prompted a lawyer for Sterling to question whether prosecutors could even proceed with their case. On Monday, Risen said he did not want to provide any information to the government that it might be able to use as a “building block” to prove or disprove a “mosaic” it was trying to make. He made the comments just days before Sterling is scheduled to begin trial on Jan. 12. It remains to be seen if Risen will testify at all. If he does and stick to his guns, will Holder stick to his statement that no journalist would go to jail on his watch for doing his or her job? However, a Justice Department official said Wednesday the department did not intend to revisit its decision to not prosecute anyone for the interrogation methods. The official said the department had reviewed the committee’s report and did not find any new information that would cause the investigation to be reopened. President Barack Obama has nominated Loretta Lynch, US Attorney for the Southern District of New York, to replace Attorney General Eric Holder who announced his retirement just before the mid-term election. Her credentials and qualifications for the post are excellent and her record in her current position. She is viewed as a strong civil rights defender, did pro-bono work prosecuting Rwandan war crimes, and has come down hard on public corruption. That said, she will likely follow Holder’s stance on Wall Street and the banking industry that they are too big to prosecute. Lynch, who joined Holder in Washington over the summer to announce a $16 billion settlement with Bank of America over its conduct leading up to the meltdown, has similarly suggested the federal government is doing everything it can to hold companies accountable. “We have to prove to a jury beyond a reasonable doubt their intent was to defraud the public, and sometimes jurors just think they were bad at what they did,” she said. The conservative news site Breitbart.com suffered a rather awkward pants-down moment when a media watchdog site pointed out Breitbart had confused its Loretta Lynches when publishing an attack on the woman President Obama has nominated to be the next attorney general. The site said the 55-year-old nominee served as one of President Bill Clinton’s defense attorneys during the Whitewater investigation of 1994. The Loretta Lynch Breitbart was referring to – the Whitewater attorney – was also a former California public utilities commissioner. She worked as the director of policy and research for California Gov. Gray Davis (D) and obtained her undergraduate degree from the University of Southern California. Her law degree is from Yale. This is nothing new for the right wing, as Rachel Maddow says they create their own parralel unvierse and stick with it. No, this is not the Loretta they’re looking for either. This administration, especially the Department of Justice really hates your Fourth Amendment rights and is doing everything in its power to narrow your right to privacy as much as it can. We’ve already questioned if it’s really true that the 4th Amendment doesn’t apply to foreigners (the Amendment refers to “people” not “citizens”). But in some new filings by the DOJ, the US government appears to take its “no 4th Amendment protections for foreigners” to absurd new levels. It says, quite clearly, that because foreigners have no 4th Amendment protections it means that any Americans lose their 4th Amendment protections when communicating with foreigners. They’re using a very twisted understanding of the (already troubling) third party doctrine to do this. As you may recall, after lying to the Supreme Court, the Justice Department said that it would start informing defendants if warrantless collection of information under Section 702 of the FISA Amendments Act (FAA) was used in the investigation against them. Last October, it finally started alerting some defendants, leading courts to halt proceedings and re-evaluate. As two of those cases have moved forward, the DOJ is trying to defend those cases, and one way it’s doing so is to flat out say that Americans have no 4th Amendment protections when talking to foreigners. The Supreme Court has long held that when one person voluntarily discloses information to another, the first person loses any cognizable interest under the Fourth Amendment in what the second person does with the information. . . . For Fourth Amendment purposes, the same principle applies whether the recipient intentionally makes the information public or stores it in a place subject to a government search. Thus, once a non-U.S. person located outside the United States receives information, the sender loses any cognizable Fourth Amendment rights with respect to that information. That is true even if the sender is a U.S. person protected by the Fourth Amendment, because he assumes the risk that the foreign recipient will give the information to others, leave the information freely accessible to others, or that the U.S. government (or a foreign government) will obtain the information. This argument is questionable on so many levels. First, it’s already relying on the questionable third party doctrine, but it seems to go much further, by then arguing that merely providing information to a foreign person means that it’s okay for the US government to snoop on it without a warrant. In the government’s view, there is no need to ask whether the 2008 law violates Americans’ privacy rights, because in this context Americans have no rights to be violated. Marcy Wheeler at emptywheel points out that former Sen Russ Feingold warned us back in 2008 about the abuses that could occur under Section 702 of the FISA Amendments Act (FAA). Would the US Government executive branch abuse it’s state secrets privilege, abuse the classification of documents, and use its ability to prevent a foreign national’s entry to the US to bar her access to the court system? Would it spend millions of taxpayer dollars on lawyers improperly? Would top Obama administration officials practice deceit repeatedly in support of efforts to avoid admission of a simple error? Here is proof that the Obama administration at the highest levels cannot be trusted to fairly, prudently and honestly wield the powers they have arrogated unto themselves in the name of national security. Not only are they a pack of liars, they are people that lack the honor and decency to admit when they have made a simple mistake and apologize for it. 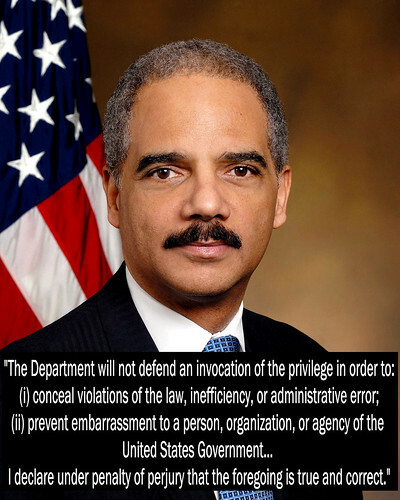 Eric Holder declared to the court that the government would not claim national security privileges to conceal administrative errors or prevent embarrassment. Holder should have been charged with perjury for his mendacity and the administration should be beyond embarrassed. Due to the clerical error committed by the FBI agent, the plaintiff in this case, having recently had a hysterectomy and wheelchair bound, was handcuffed, detained and denied her pain medications for hours. After she was released and returned to her home country, the administration barred her from returning to the US to attend her trial. Most normal folks after discovering that they have by error caused someone pain, embarrassment and severe inconvenience would find apologizing for their error to be the right thing to do. Apparently the Obama administration is not peopled by normal folks. At long last, the government has conceded that plaintiff poses no threat to air safety or national security and should never have been placed on the no-fly list. She got there by human error within the FBI. This too is conceded. This was no minor human error but an error with palpable impact, leading to the humiliation, cuffing, and incarceration of an innocent and incapacitated air traveler. That it was human error may seem hard to accept – the FBI agent filled out the nomination form in a way exactly opposite from the instructions on the form, a bureaucratic analogy to a surgeon amputating the wrong digit – human error, yes, but of considerable consequence. Nonetheless, this order accepts the agent’s testimony. In stubborn resistance to letting the public and press see the details of this case, the government has made numerous motions to dismiss on various grounds, including an overbroad complete dismissal request based on state secrets. When it could not win an outright dismissal, it tried to close the trial from public view via invocation of a statutory privilege for “sensitive security information” (“SSI”), 49 U.S.C. 114(r) and 49 C.F.R. 1520.5, and the “law enforcement privilege.” Roviaro v. United States, 353 U.S. 53, 59 (1957). At least ten times the trial was interrupted and the public asked to leave so that such evidence could be presented. Given the lengths that this administration has gone to in order to cover up a petty error made during a previous administration, one can only imagine the abuses of office and the national security and secrecy powers that they have arrogated unto themselves to cover up errors serious enough to be called war crimes. Just as many conservatives abandoned their principles in following George Bush blindly, many liberals have chosen to ignore Obama’s concerted efforts to protect individuals accused of war crimes. The administration has no burden of proof whatsoever to overcome before “disposing” of someone, even an American citizen. 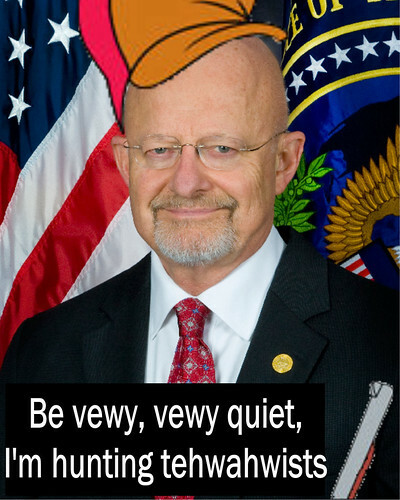 … When he ordered the murder of Anwar al-Awlaki, an American citizen without charging him with any crime, and without presenting any evidence to anyone, he avoided questions by hiding behind executive privilege. Only weeks later, Obama ordered another drone strike that killed Awlaki’s 16 year old son, and also refused to answer the serious questions surrounding that strike. In December 2011, President Obama signed the 2012 NDAA, codifying indefinite military detention without charge or trial into law for the first time in American history. The NDAA’s dangerous detention provisions would authorize the president – and all future presidents – to order the military to pick up and indefinitely imprison people captured anywhere in the world, far from any battlefield. This is just too much unaccountable power to be vested in any president. Would the people who claim to care about justice, civil rights and civil liberties please wake up? In the United States (46th, -13), the hunt for leaks and whistleblowers serves as a warning to those thinking of satisfying a public interest need for information about the imperial prerogatives assumed by the world’s leading power. Press freedom in the United States dramatically deteriorated in 2013, a special report by CPJ found. The Obama administration’s policy of prosecuting officials who leak classified information to the press intensified with the sentencing of Chelsea Manning (then known as Pvt. Bradley Manning) to 35 years in prison and the indictment of NSA consultant Edward Snowden. As part of its investigations into earlier leaks, the Justice Department revealed it had secretly subpoenaed the phone records of nearly two dozen Associated Press telephone lines and the emails and phone records of Fox News reporter James Rosen. The two cases, and language in the Rosen subpoena that suggested the journalist could be criminally charged for receiving the information, provoked widespread criticism. The backlash resulted in the drafting of revised Justice Department guidelines on press subpoenas and a renewed debate in the Senate of a federal shield law that would allow journalists greater protection for their sources. As the debate moved forward in the Senate, a federal appeals court rejected an appeal by New York Times reporter James Risen in his long-term effort to protect a confidential source, setting up a likely Supreme Court showdown. Snowden’s leak of a still unknown quantity of classified information on secret surveillance programs spurred both a national and international outcry and, after a report that Al-Jazeera’s communications had allegedly been spied on, caused journalists to fear even more for their sources. The secrecy surrounding the surveillance programs echoed a pervasive lack of transparency and openness across government agencies where, despite President Barack Obama’s promise to head the most open government in history, officials routinely refused to talk to the press or approve Freedom of Information Act requests. Journalists faced limitations covering national security-related trials, in cases of alleged terrorism at Guantánamo Bay and in the court-martial of Manning in Virginia. Delphine Halgand, U.S. director of Reporters Without Borders, joined [Democracy Now! ]’s Amy Goodman and Nermeen Shaikh to discuss the decline of the free press and the safety of journalists. As we have documented here at Stars Hollow, the task force that was created to pursue mortgage fraud and hold the banks accountable was, and is, a sham game to protect the banks from real relief for defrauded homeowners. A newly unsealed lawsuit, which banks settled in 2012 for $1 billion, actually offers a different reason, providing a key answer to one of the persistent riddles of the financial crisis and its aftermath. The lawsuit states that banks resorted to fake documents because they could not legally establish true ownership of the loans when trying to foreclose. The forged documents were endorsed by employees of companies long bankrupt, executives who signed their name eight different ways, or “people” named “Bogus Assignee for Intervening Assignments” so that the banks could establish standing to foreclose in courts. The end result, according to white-collar fraud expert Lynn Szymoniak, is that over $1.4 trillion in mortgage-backed securities are still, to this day, based on fraudulent mortgage assignments. The lawsuit against Wells Fargo, Bank of America, JPMorgan Chase, Citi and GMAC/Ally Bank was settled in early 2012 for $1 billion, but now that the evidence is unsealed, Szymoniak and her legal team are free to pursue the other named defendants, including HSBC, the Bank of New York Mellon, and US Bank. “I’m really glad I was part of collecting this money for the government, and I’m looking forward to going through discovery and collecting the rest of it,” Szymoniak told Salon. This was the second time, mind you, that Holder’s Justice Department had pulled a stunt like this. In December 2010, Holder held a press conference to tout a supposed sweep by the president’s Financial Fraud Enforcement Task Force called “Operation Broken Trust.” (The mortgage-fraud program was part of the same task force.) As with the mortgage-fraud initiative, Broken Trust wasn’t actually a sweep. All the Justice Department did was lump together a bunch of small-fry, penny-ante fraud cases that had nothing to do with one another. Then it held a press gathering. Between this sham that protects the banks and the egregious violations of the press and privacy of all Americans with abusive use of FISA, Eric Holder owes us more than an apology, he owes us his resignation as Attorney General.